The trending color blush had us hooked with it’s soft, pretty hue. Jen and I recently attended Las Vegas Market. We had so much fun to visiting all the vendor’s showrooms. We got caught up on all the latest and greatest in furniture, decor and textiles. We were seeing a strong presence of the color blush which is delicate and understated! I pulled together some of my favorite blush trends I have been noticing in our industry. Blush pairs so pretty with gold and we all know there isn’t a lack of gold anywhere these days! Blush isn’t just for your cheeks anymore, or even your baby girl’s room. This soft hue is elegant, fresh and a little feminine. We also love it paired with Rattan and fur textures. Give it a try and add a pop to your next room design. Even a little bit will go a long way! 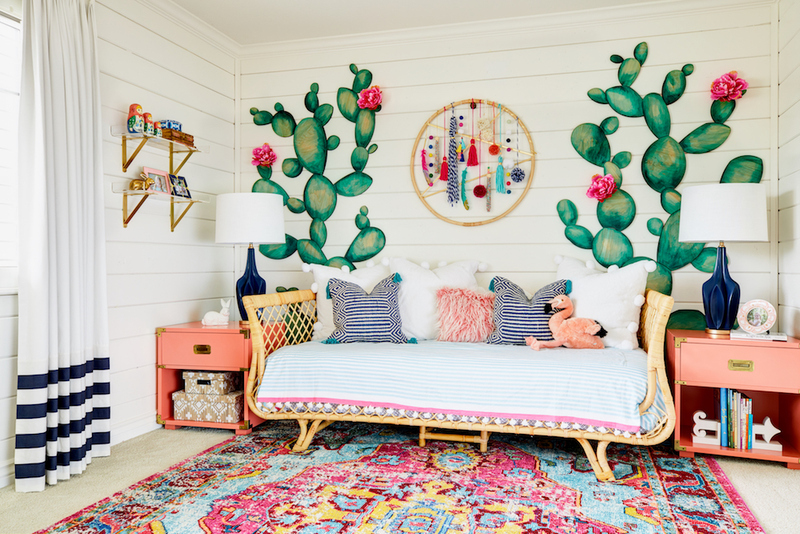 We all need a Boho Cactus Room in our home right? Designing rooms in my own home is always a little daunting, but so much fun at the same time. It is funny because when I design for clients I feel like a have a clearer vision of what I want to do. When it comes to my own house I flip flop on ideas, fret about it and sometimes just sit on it for a while until the ideas start flowing. Marin’s new room was no exception to this! Yes, I still think it is cute but I designed it almost 5 years ago and well, I’m sick of it now! I guess that is just one of the bad things about being a designer, trends come and go and you want to keep things fresh. Here is the before of Marin’s room, this is what it has looked like since she was 2 1/2. Awww, look at her, isn’t she cute! My baby has grown up way too fast. Now that Marin is in 1st grade I decided that I wanted to give her a room that had a little more room for her to hang out with her friends as well as an area for her to do her homework. 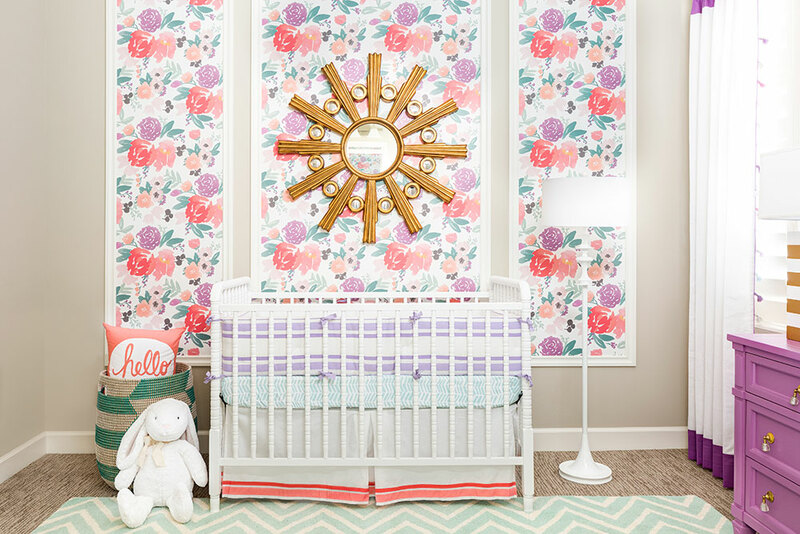 I collaborated with our friends at Serena and Lily to create a room for Marin that reflected her personality. 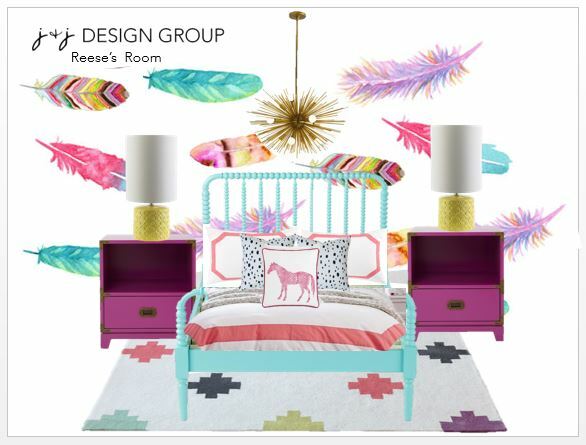 Here is the design board that I came up with for her new room. I was flipping through a Serena and Lily catalog and I totally fell in love with this daybed. This is their Avalon daybed and it is made from rattan and had the perfect Bohemian look I was going for! Once I laid eyes on this bed, I knew I had to build her room around it. I love this rug because it has so many fun colors to pull out if it and use around the room. 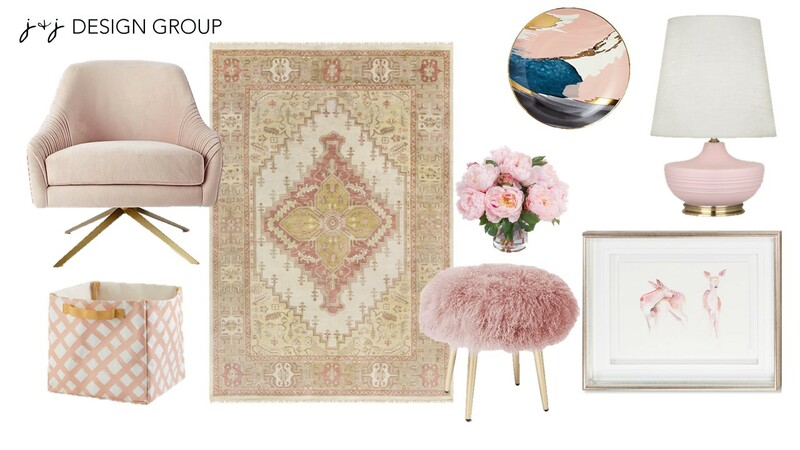 The rug has a vintage Turkish rug vibe that I was totally into, I knew it would add so much character to the room. Let’s move on to the cactus. This was such a labor of love for me. 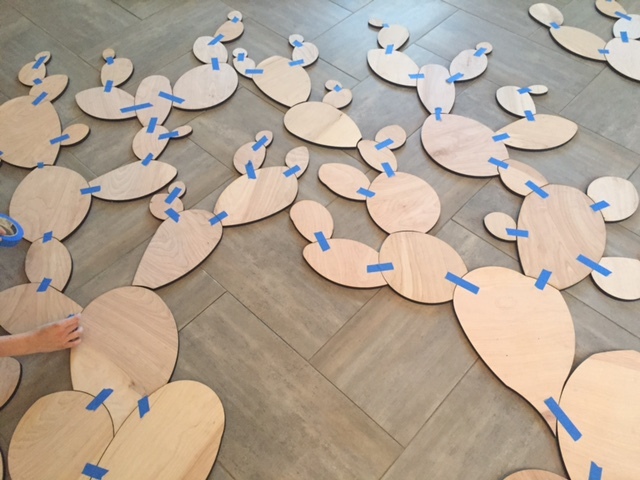 I designed on the computer and then cut each piece out of wood on a laser cutter. 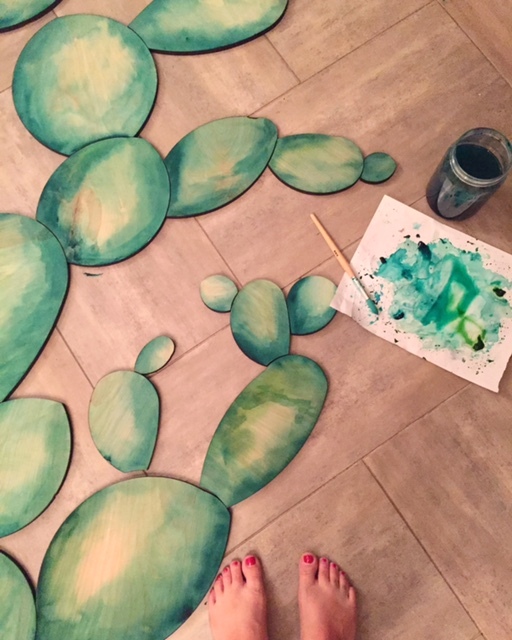 Once I had all the cactus pieces cut out, I hand painted them all with watercolor. Yes, I am a little crazy but I am so happy with how it turned out! Here are the cactus after I cut them, next I laid them all out and numbered them so I could put them back together in her room. This is a photo of the cactus once I painted them with watercolor. It took me about 6 hours to paint all of the cactus and I did it over several days, accompanied by Netflix of course! I added a few silk flowers that I found at IKEA, the color and scale was perfect for what I was looking for. I attached the cactus to the ship lap walls with a pin nail gun. I can easily take them down and bring them with me when we move to our new home in a few months. A desk area was a must in Marin’s room. She is very creative and loves to draw and do crafts. Let me promise you this, it is never this clean! 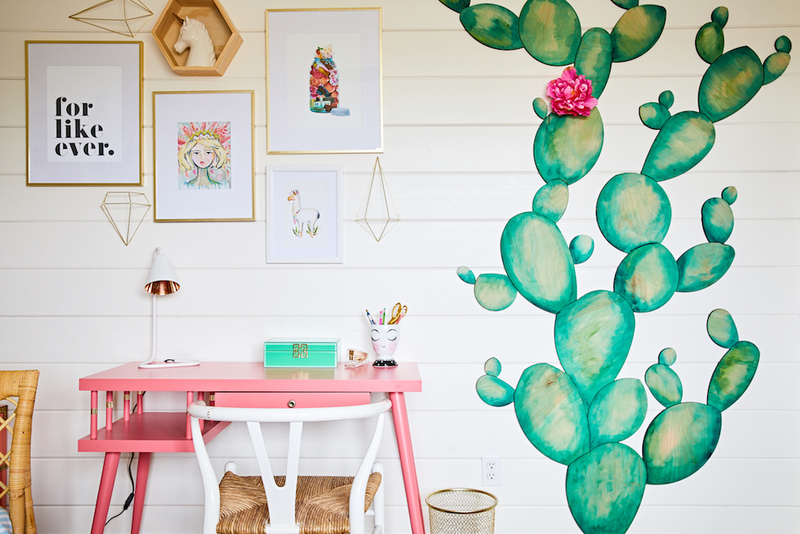 The desk was one of my vintage finds that I had painted in a fun pink color. One of Marin’s favorite things in her room is the art print of the lady. She thinks it looks just like her:) We also love that the artist’s name is Maren! Find her print here on Etsy. Let’s not forget what might be the best part of the room…… her hanging chair. This amazing chair is also from Serena and Lily and she loves it so much. 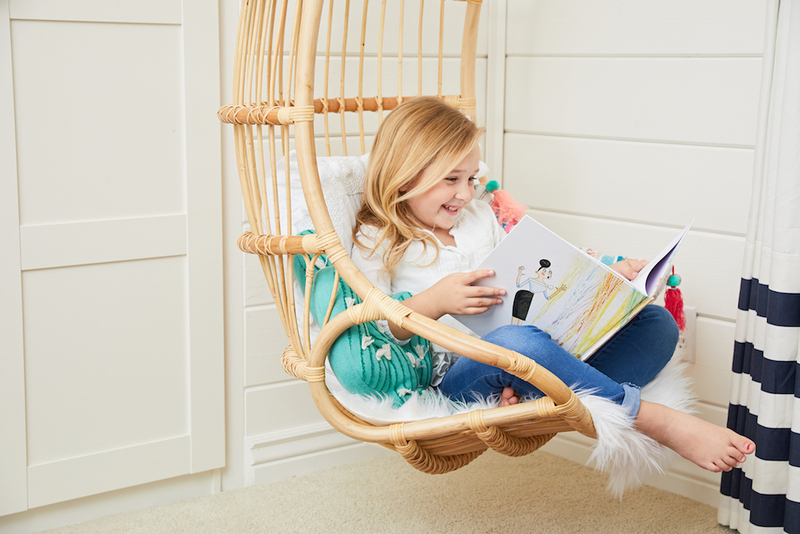 Whether it is listening to music or reading books, it is always just a little more fun when it is in your very own swinging chair! Gosh she is growing up way too fast. 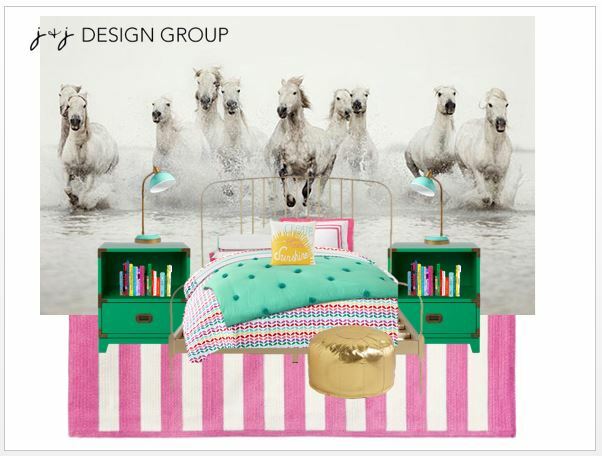 When we were approached to design a Horse inspired bedroom we were intrigued, this was a first for us. We love getting to know our littlest clients, although Reese isn’t really that little. She is a very mature 9 year old that loves riding horses all year round. 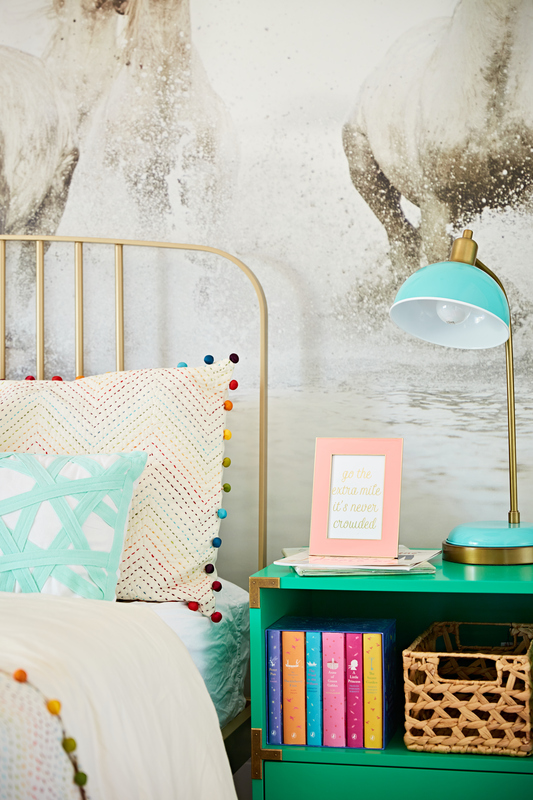 A horse inspired room wasn’t even a question for her. Reese and I share a birthday just a couple days apart so I feel like we are on the same page when it comes to creativity. She’s got big ideas and will definitely put them to good use as she gets older. She is a girl after my own heart and one of the sweetest little equestrians I know. I sat down with Reese and she made it very clear that she loved horses, the color aqua and hanging with her friends any chance she could get. I originally took what she had asked for and pulled in some of the elements she had mentioned. This was the original design board we presented to her. We showed this to Reese and she said “Well, it’s pretty but you don’t understand, I really like horses” Apparently the horse pillow I selected wasn’t cutting it! Ha! I love a girl that knows what she likes. Takes one to know one I guess. So I went back to the drawing board. Sometimes rooms evolve a little until it is just right. I took her comments to heart and gave her what I had hoped she really wanted. This is what I showed her next! This was it, exactly what she wanted. I am pretty sure the horse mural sold her! Ready to see how it turned out? Sometimes it is crazy to see how much the actual room looks exactly like I imagined it in my head and on my design board. This room was no exception. A reading nook was a must for Reese! She loves to read and she needed to have a comfy spot to plop down and get lost in a book. Desk for homework? Yes please! 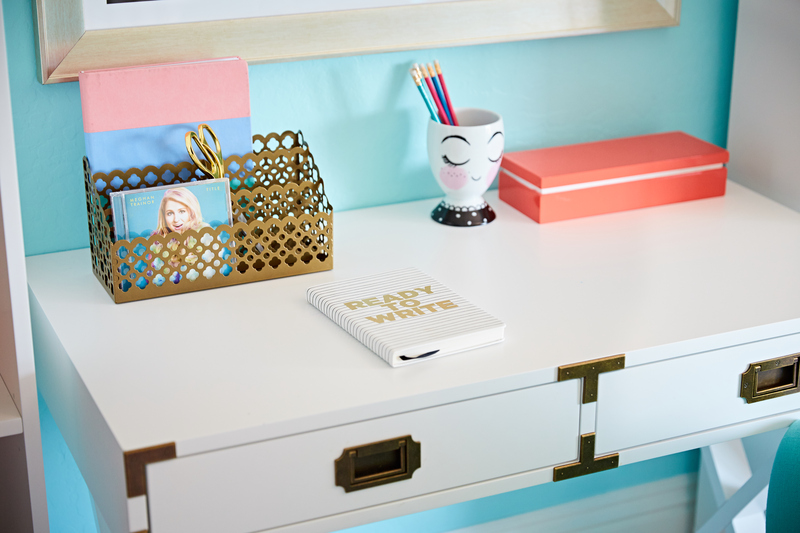 Maybe doing homework will be just a little less tedious when you are doing it in your cute room…. we like to think so anyway. This art wall was especially fun for me to create. I love to make things so I took the opportunity to get creative an custom make a couple things special for Reese for her art wall. I cross stitched the large “R” that I found at Hobby Lobby. I found some yarn coordinating with the colors in her room and just made up the pattern as I went. What about that cute unicorn on the wall? Well, the horse head was white, I found it at Homegoods and spray painted it gold. Gosh I love spraypaint!! 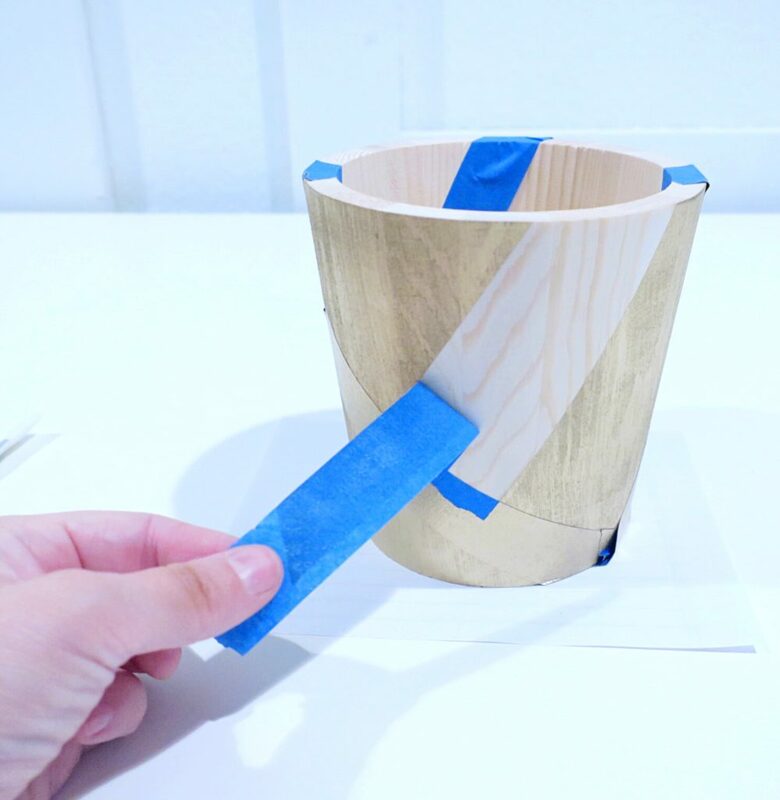 I crafted a horn out of some bendable cardboard and added different colored string with my trusty glue gun. Last but not least, this roller skate is a little close to my heart. I loved to roller skate when I was little and so does Reese. 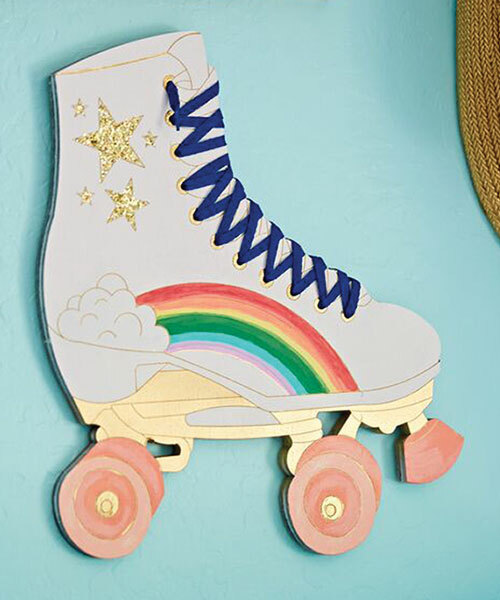 I just had to design her a custom roller skate for her wall. Yep, that is a real shoe lace. This cute skate is now available for purchase in our shop. Just a few more details to round our this happy little space. What do you think? Does this room make you happy? We have been hired to design what seems to be a lot of bathrooms lately. 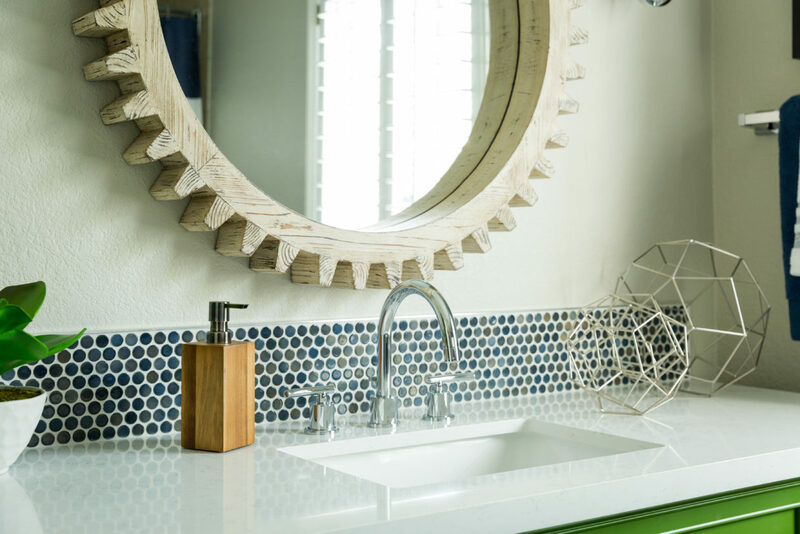 Master bathrooms, guest bathrooms, kid’s bathrooms and don’t forget the Powder room. 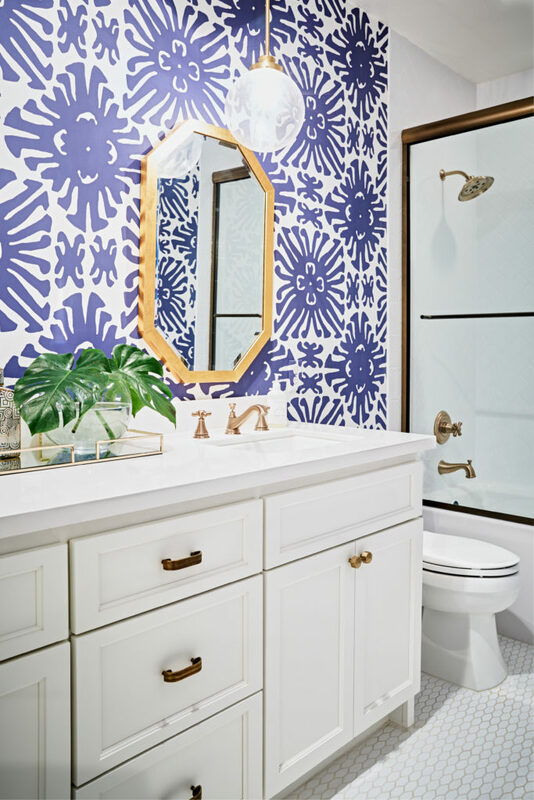 Bathrooms can be designed with tons of personality. 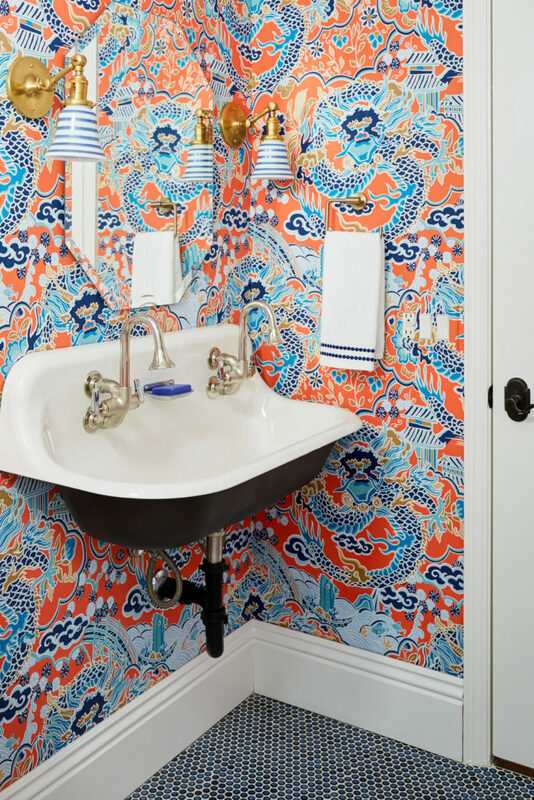 Wallpaper is always a good idea for the bathroom especially a powder room! It says to your guests “hello, even I take design risks and sass up my bathrooms”. Just because bathrooms don’t have furniture doesn’t mean they can’t have high style like the rest of the house. Check out a couple of our latest bathrooms! This powder room is a knock out! 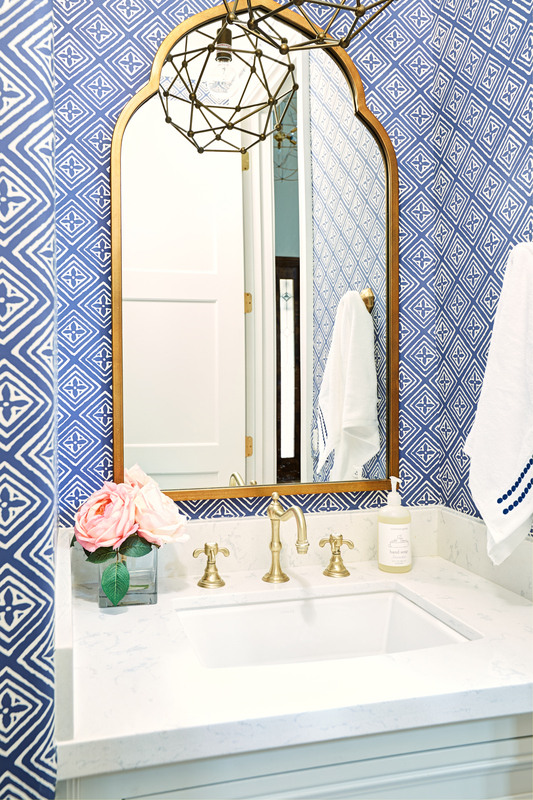 A crisp white vanity, navy paper and you cannot go wrong with brushed gold details. I just love high contrast and tons of color. This Casita bath may be one of my absolute favorites to date. What can I say, it’s just HAPPY!! This kid’s bathroom is fun and playful. It is shared by 3 kids whom all love dogs. So we thought what better than some cute doggy wallpaper in a cheery mint and coral combination. I wouldn’t mind if this was a part of my bedtime routine. It may make it easier to get the kid’s to brush their teeth at night. 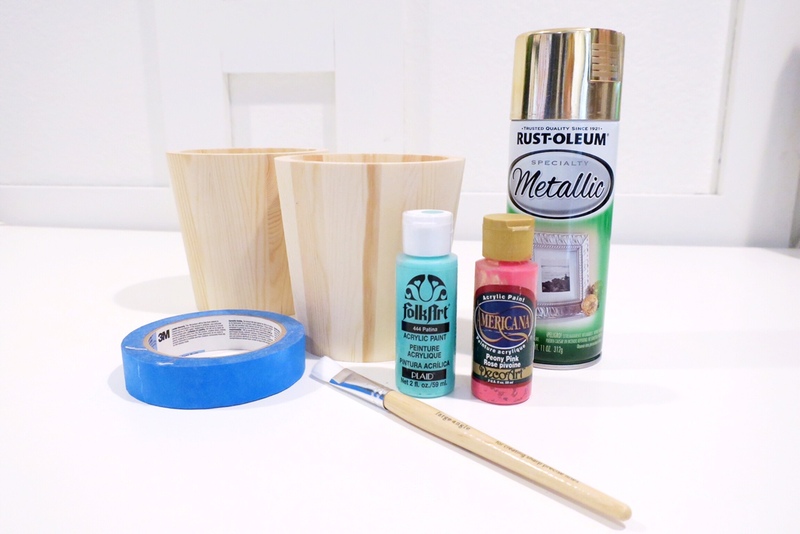 Let’s not leave the guests out, they need a pretty bathroom too! I love how this combo of dramatic wallpaper paired with hex tiles and brass fixtures makes this bathroom fun but elegant. 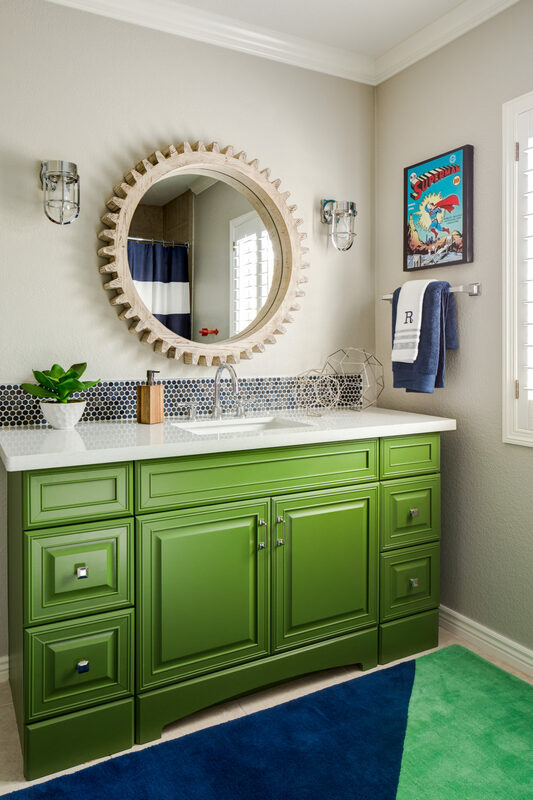 Master bathrooms can have just as much personality as the rest of the bathrooms in the house. 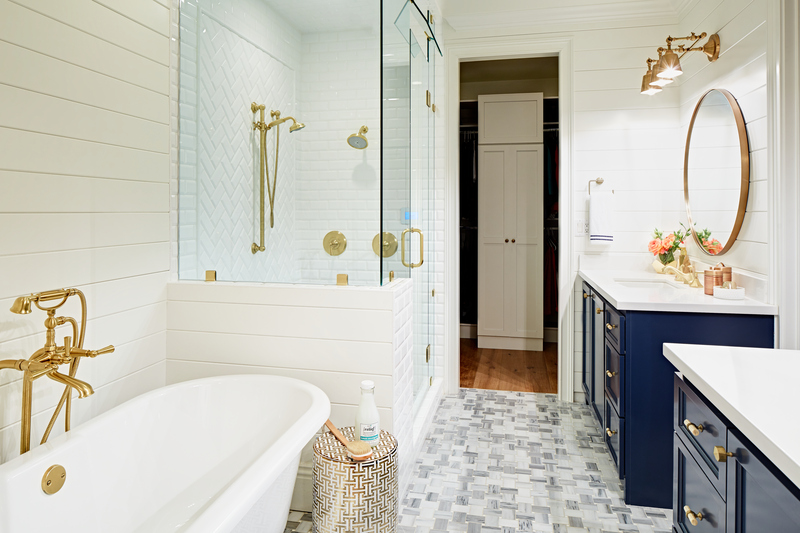 This master is very elegant with it’s navy vanities, marble tile and of course brushed gold fixtures. All of these bathrooms were quite different before. Maybe we need to post some before and after pics so you can see just how much they transformed from what they were! Anyone who knows me, knows I am a sucker for office supplies and organizational vessels ha! Target has the best craft isle and every time I head down it, I can’t help myself but pick up some new thing. 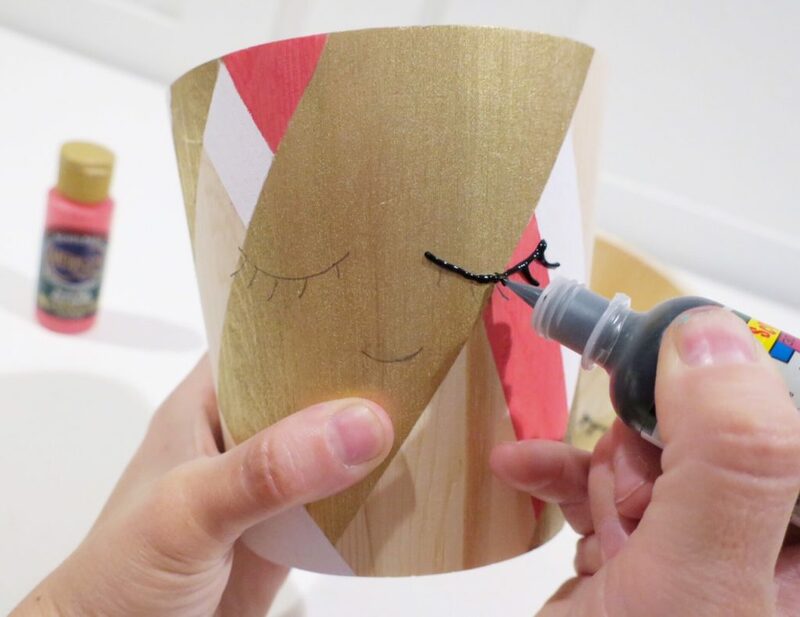 I found these cute little wood cups that are raw wood and were just screaming my name, so I’m showing how to make these cute little DIY Pencil Cups! 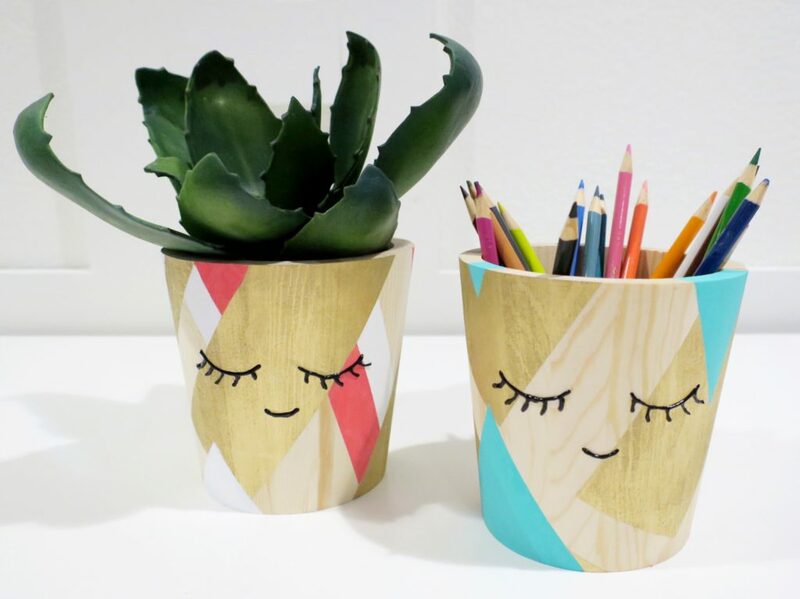 These could even be a cute gift to give teacher’s for their desk at school. Hey Jo, wanna craft something??? Why I sure do! I was working on accessorizing a client’s kitchen and they have the cutest little play table that I had painted navy blue that the kids could do their crafts on. I wanted a cute way to display all their crayons and markers so I made these little cuties. 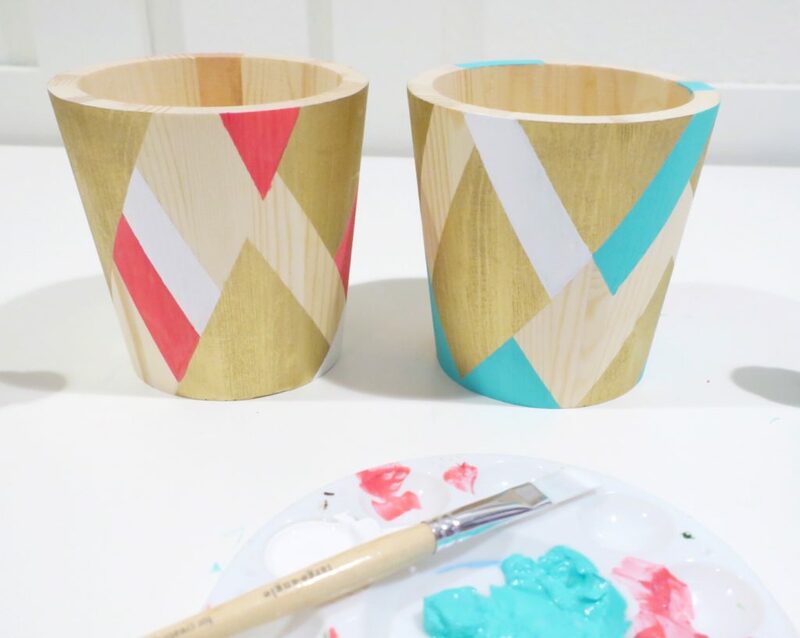 These are so simple to make anyone can do it. Crafty or not! Here is what you need to get started. I started by taping off the containers at a diagonal. The first layer I was masking the parts that I wanted to keep the natural wood. I then painted them with a gold spray paint. 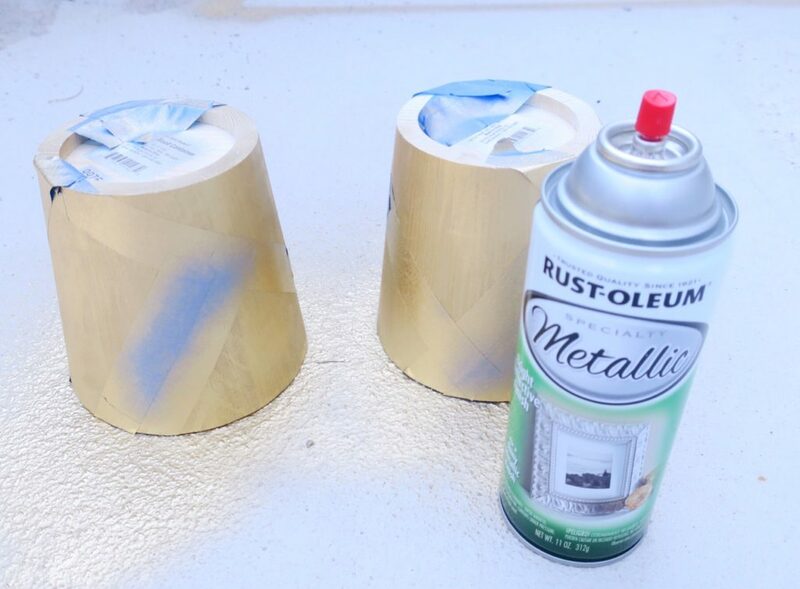 The Rustoleom one from Home Depot happens to be my personal favorite of all the gold spray paints. 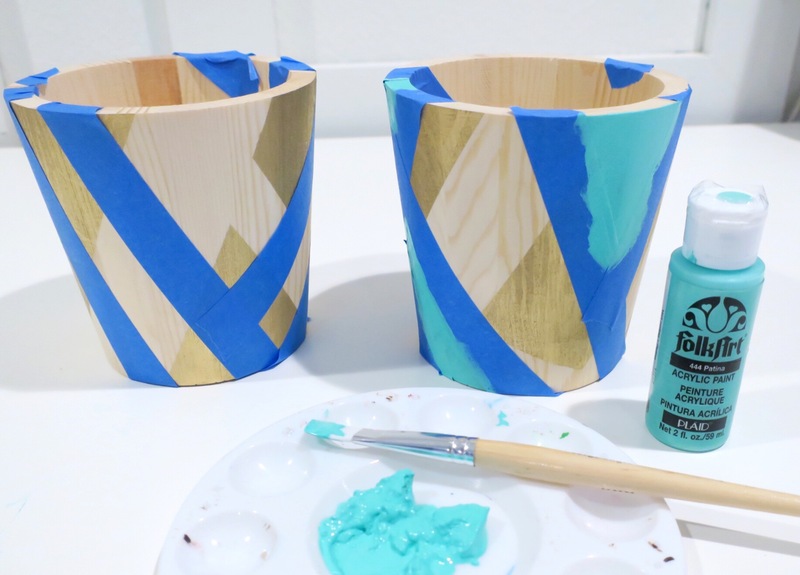 I turned the cups upside down when I sprayed them so the top rim would stay the raw wood color. Next I pulled off the tape to see what areas were left to add colored paint to. I then taped the containers again at a diagonal to mask off some of the raw wood areas and some of the gold areas. Now, I will be sure to have bold lines and still keep some of the gold and wood intact. Lastly, draw on the face you want to add with a pencil first to make sure it is just how you want it. Then draw over the line with black puffy paint and let dry. 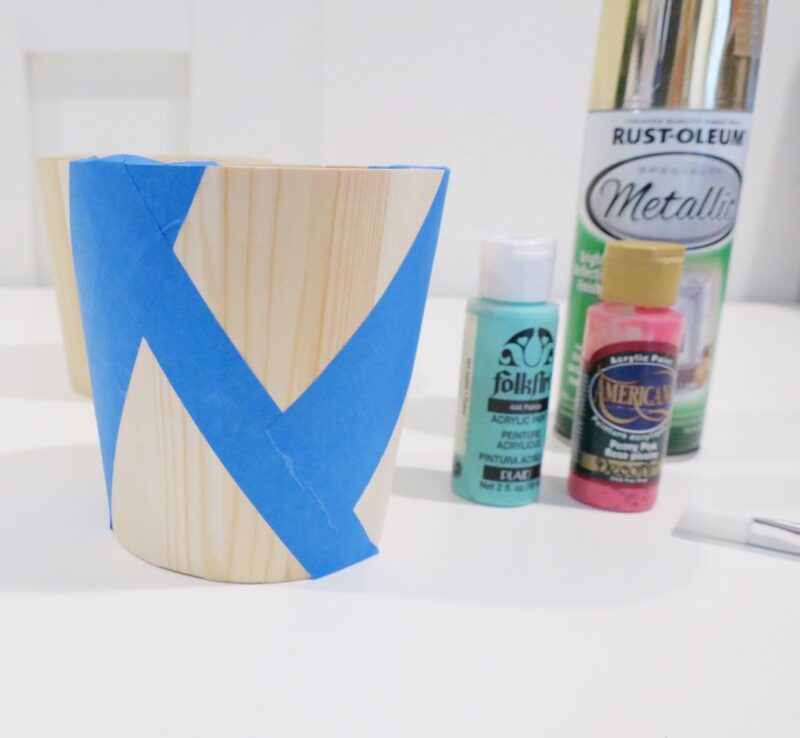 Finish it off with a coat of Satin clear coat spray paint so it doesn’t mar easily. 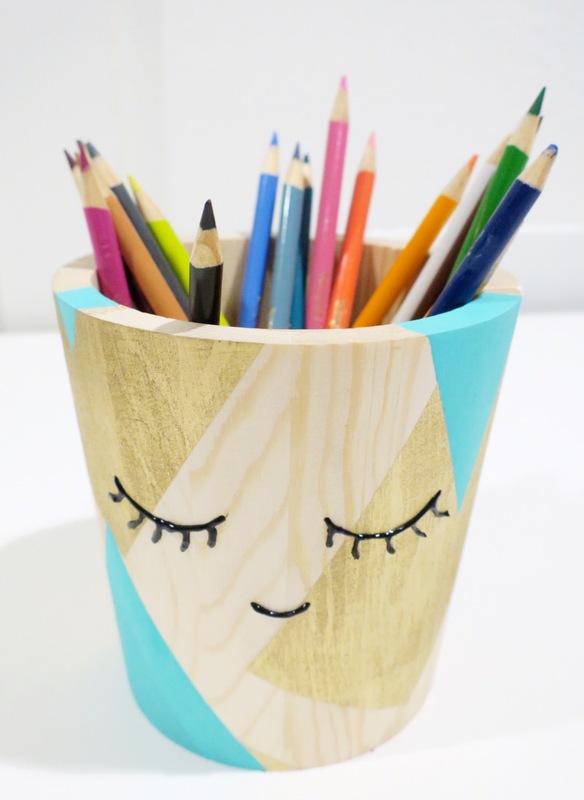 And there you have it a cute little pencil cup for a playroom, desk or even for your kitchen. The final room in our three part series reveals! 5 year old Riley and his Dad wanted a room they could call their own. Something that they could hang out in, be together, and make memories. Dad really wanted a space to watch movies and relax. Riley just wanted a cool room to play in with his buddies. They both share a love of all things Star Wars, so we sprinkled a little of that throughout the room. The room was a blank slate, the only thing we needed to work with was the white wainscoting in the room. With the white details all around, we knew we could go bold on the wall. The Navy went up and we were in love! The PLAY letters take the stage in the room. 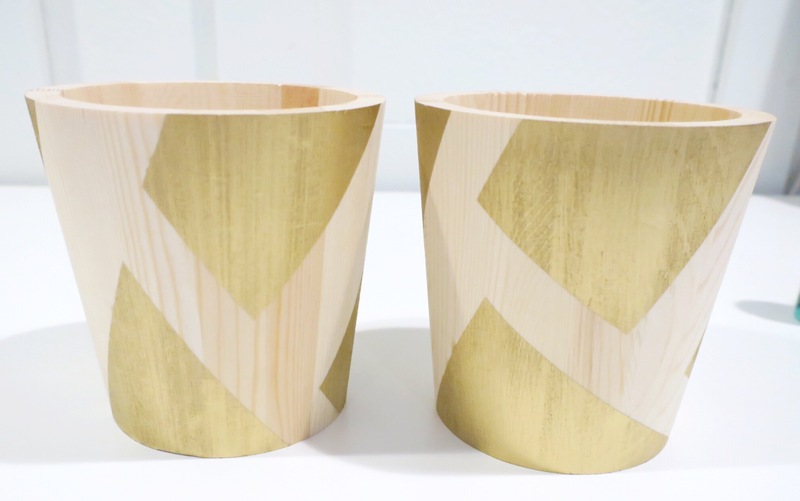 They are one of our favorite items to add at the moment..
We found these on Etsy from sawandsteel. A quick game of Hungry Hungry Hippos is always a good idea! The sofa is so comfy and looks good too! How about that button detail? Riley’s playroom had double closets opposite the white IKEA shelf, so a little surprise we dreamed up for Riley was a little Playhouse loft Art Nook. We went back and forth on what he would like best, and ended up deciding on a custom Art Desk where Riley could sit and draw for hours. (Additional bonus…it could grow with him!) We added an additional stool so dad or his friends could join in as well. He is able to display his artwork on wires that we put on eye hooks across the back wall. We wanted the back wall to have a WOW factor. We decided on a reclaimed wood wall that was found from an old fence in Kentucky! We are so lucky to have a source to pick these babies up…. (psst. 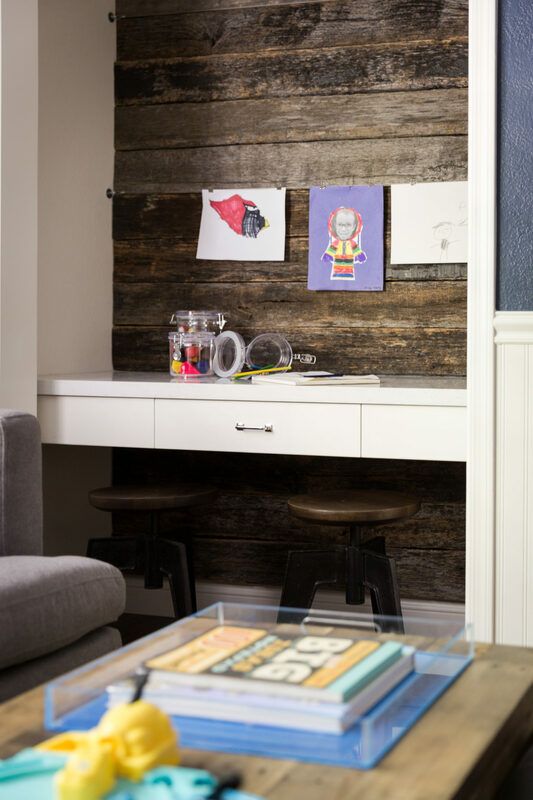 Porter Barnwood) Dad, loves a good story, so the wall having a history makes the wall one of his favorites in the room. Since we have installed these rooms, Mom and Dad have told us that Riley is always at his Art Nook. It’s his favorite place to unwind and create new masterpieces to display. We are thrilled that he loves it so much! We are looking forward to many more projects with this fun family! 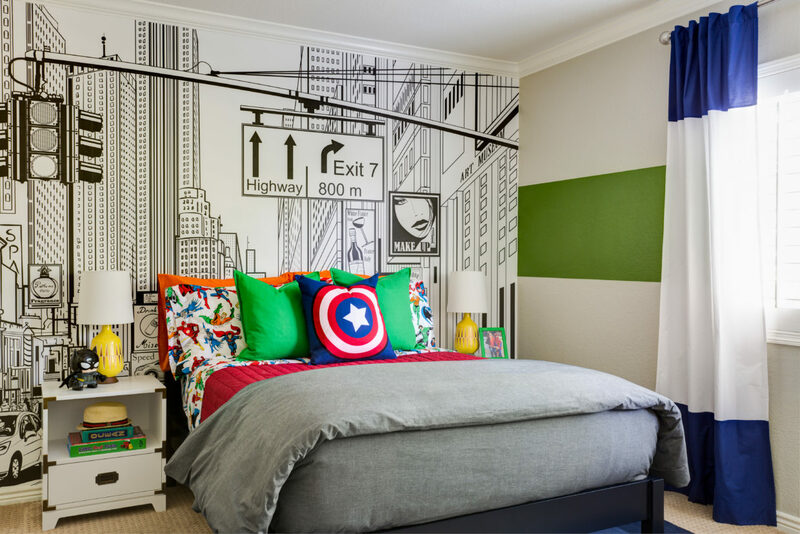 When the parents of a charming 5 year old little boy approached us to design his bedroom, we jumped right in! 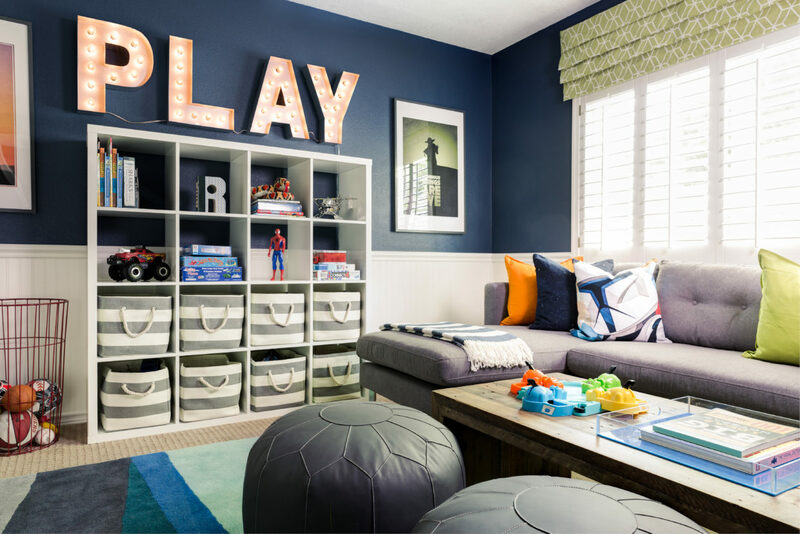 We love designing rooms for littles! 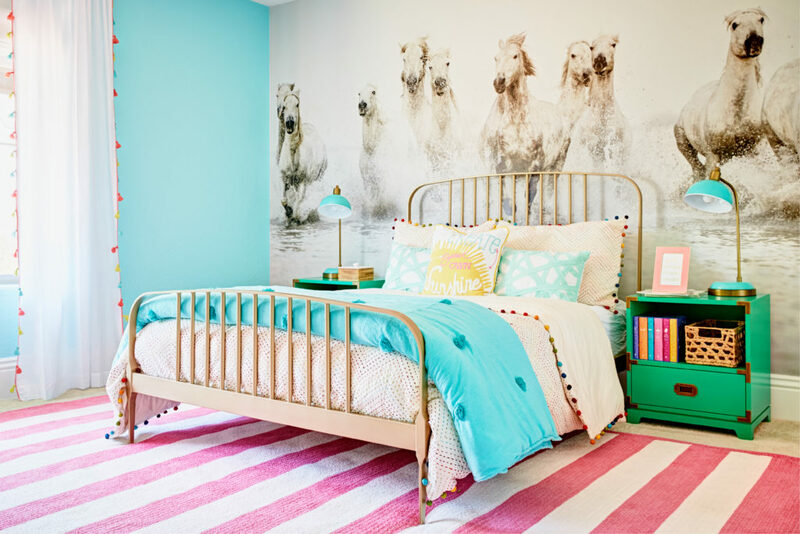 Kids rooms make our hearts sing… not only are they more colorful and fun, you can take a few more risks that end up being our littlest client’s favorite thing about the entire space. The parents wish list for Riley’s room was: a big boy bed, a desk, a quiet reading area, and lots of color. Oh! And we had to feature his favorite super hero, Captain America. His parents also wanted a little nod to New York as well, one of their favorite places to visit. Usually, we try to stay away from themes,but thought a nod to comic books would be awesome! Our focal point was the comic inspired mural! How cool is this? We love how it looks like it was pulled out of the page of a comic and that Spidey himself might make an appearance swinging between the buildings. 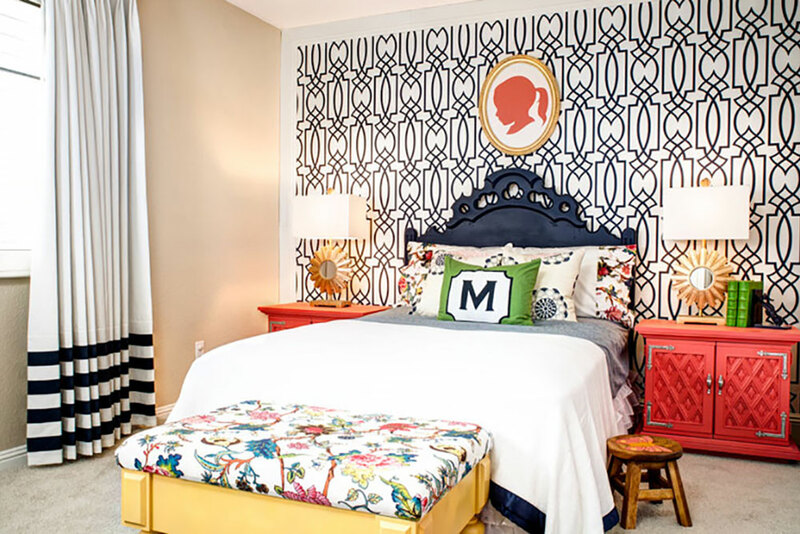 When choosing a strong graphic print, we like to have the rest of the room be a little more subtle in pattern, but filled with LOTS of color! We painted a thick green stripe around the room to give the other walls interest. How perfect are these super cool sheets from Pottery Barn Kids?? (psst! They are on SALE right now!). 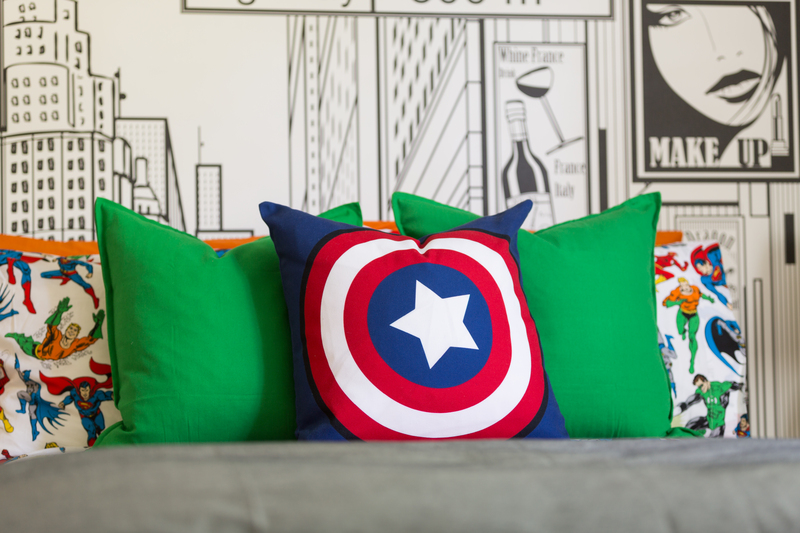 We mixed in some solid colorful pillows in orange and green from IKEA for added punch. Captain America is front and center with the star shield. 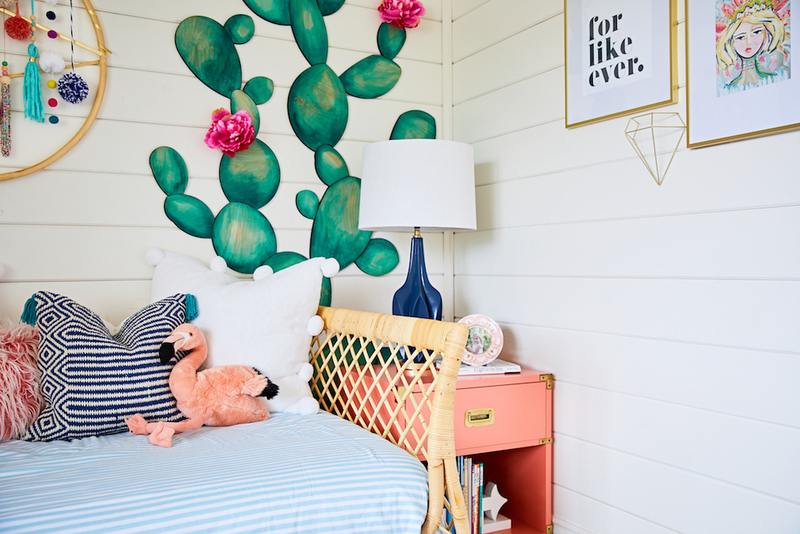 We found these darling nightstands from Land of Nod, (we found his bed there too…) and accessorized them with one of our favorite lamps of the moment. We love that these lamps give a cool retro vibe, but that they aren’t super theme-y. Definitely something Riley can have from grade school to College! 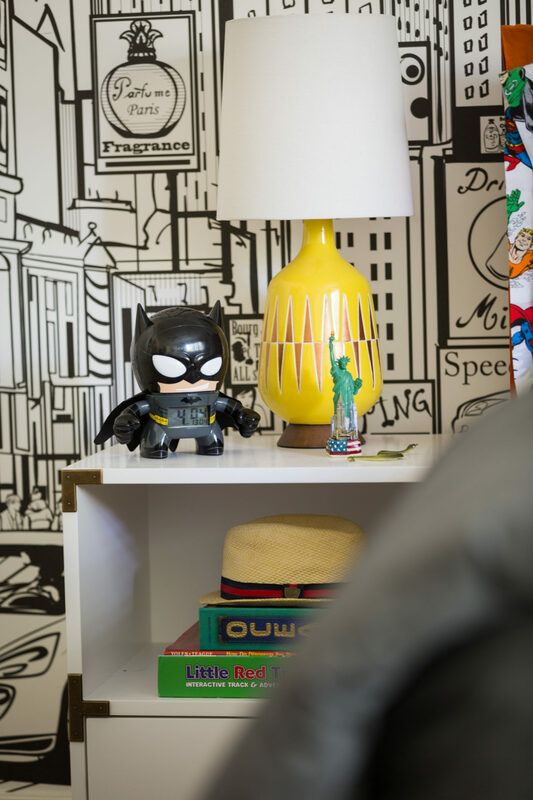 We found the batman alarm clock out our local Home Goods Store and accessorized the rest of his nightstand with things he already had. Across from the bed, we set up a little reading nook. The mid-century inspired chair invites little Riley to sit with a good book and put his feet up. 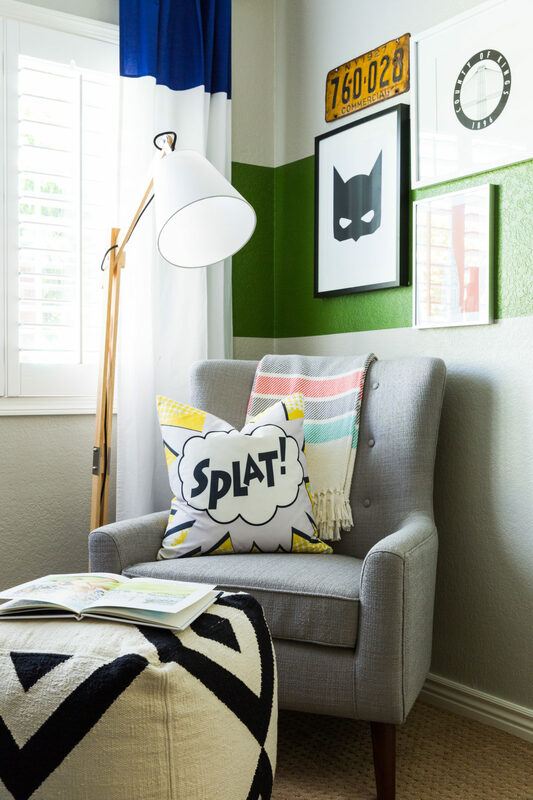 Behind the chair, we personalized the area with a print of batman (that doesn’t scream kid) and some of the family’s favorite places in New York. 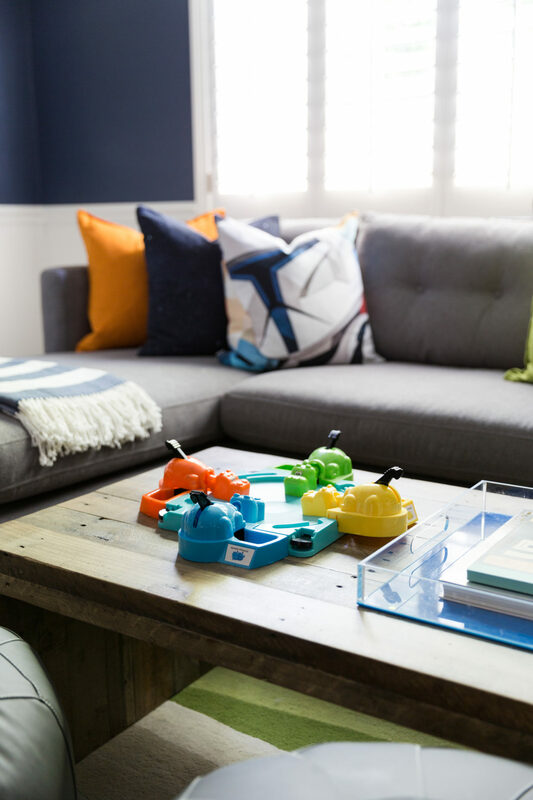 The commercial license plate give us the pop of color we need on that side of the room. 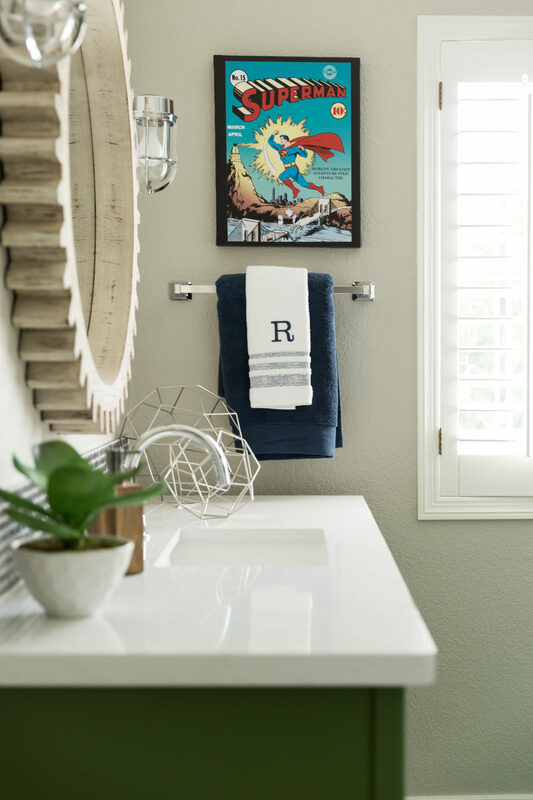 Stay tuned for little Riley’s Bathroom reveal next week! We have an obsession with wallpaper, not only are they works of art, but they add a lot of charm and character to a room. 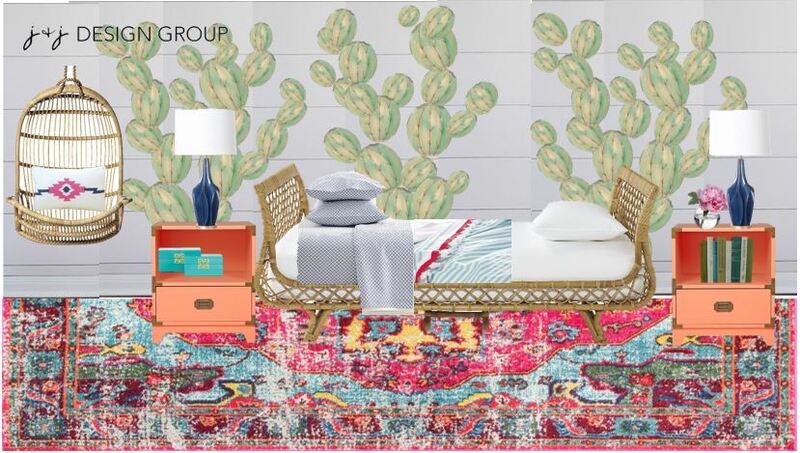 Check out our top picks for wallpaper these days! It’s not your grandma’s wallpaper anymore!! This is one of our favorite master bedrooms…The paper gives a visual punch, but it’s subtle. We weren’t looking for subtle here! 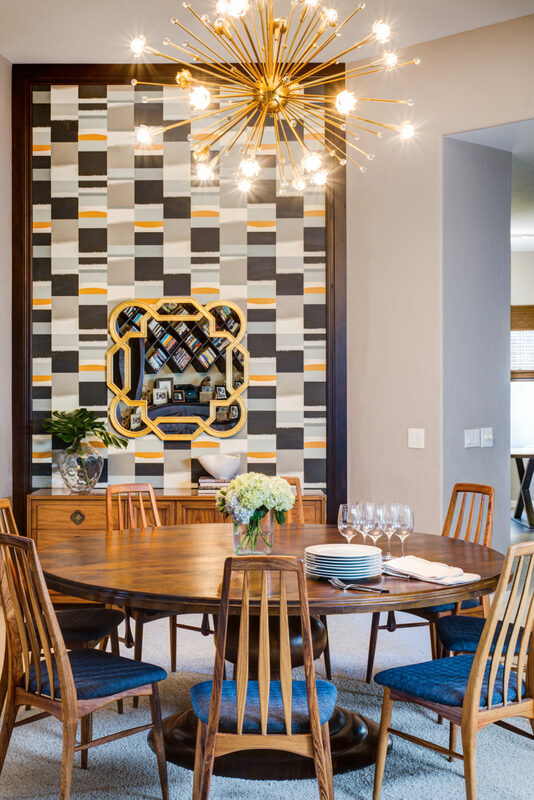 This mid century dining room dazzles! We chose a sea glass colored grass cloth wallpaper for this dining room. We love the texture it adds to the room. This fun office is full of drama! The vintage inspired bird wallpaper is gorgeous! This wallpaper is requested often by our clients. It’s a printed grass cloth, so you don’t have to mess with seams. 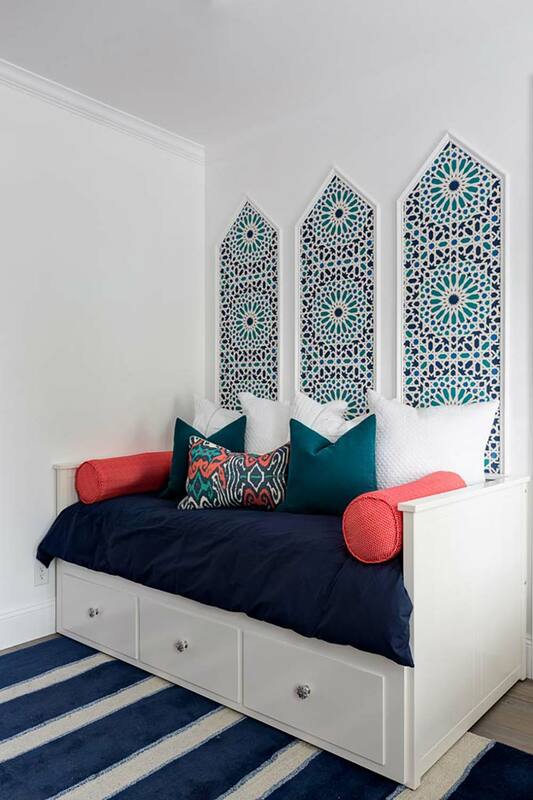 Architectural details + Fun Wallpaper = YES! 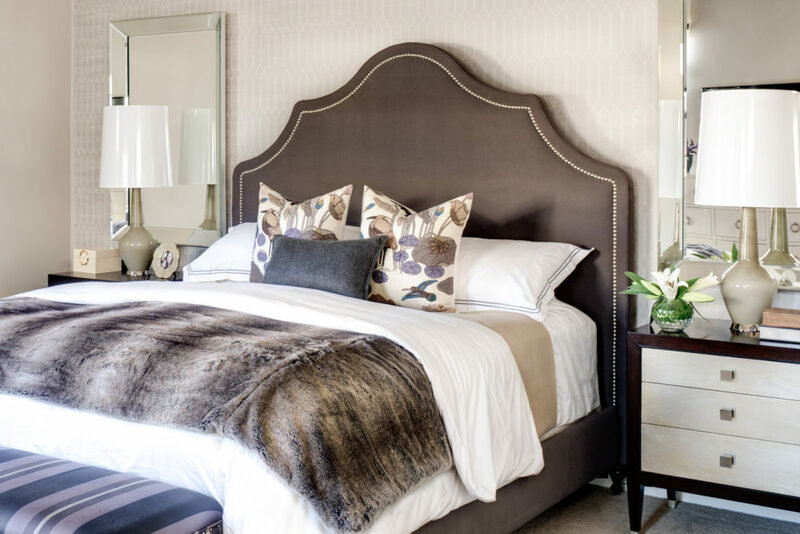 We are in love with this guest room! 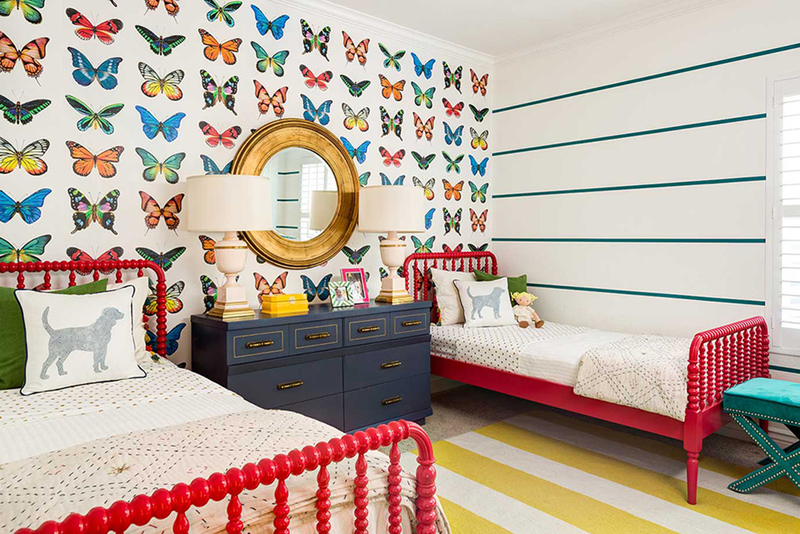 Wallpaper is probably the first thing we think of when we think about pulling together a kids room. Check out some of our favorite wallpapers to be inspired in a jiffy! 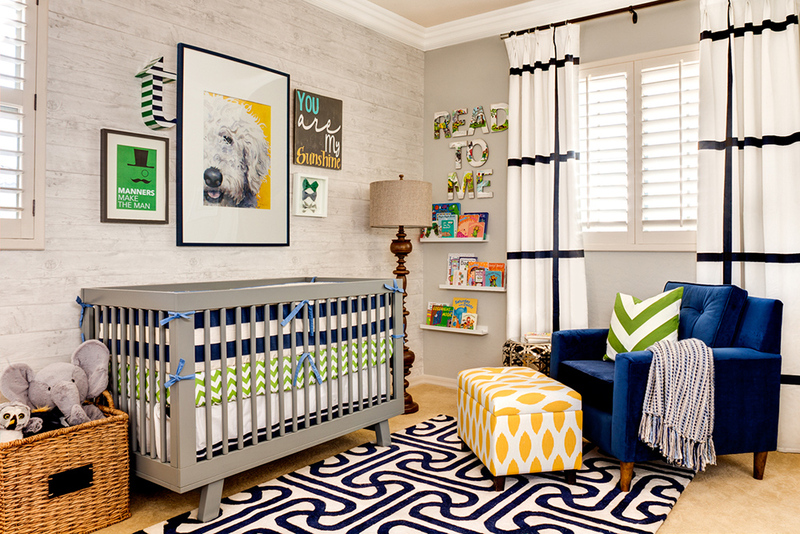 This room we created for Brooke Mahan of What’s Up Moms for her son Calvin. This turquoise vintage inspired paper is from Hygee and West. 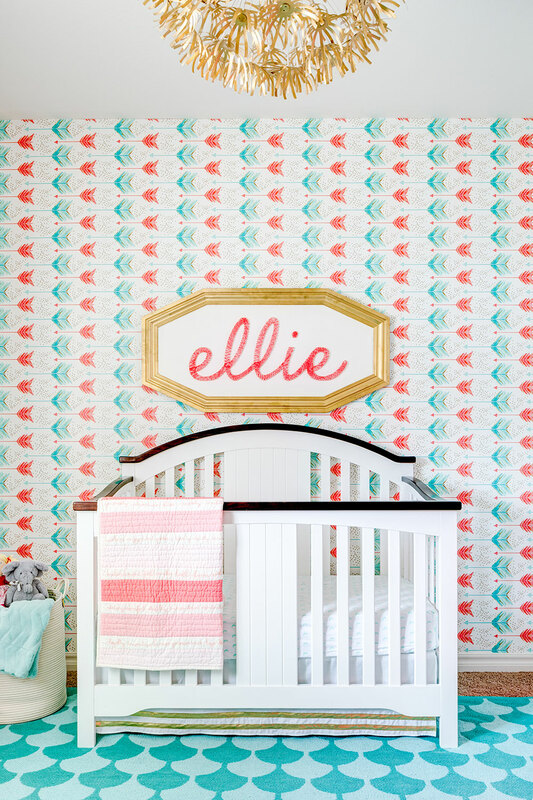 Ellie’s Nursery is sweet with the coral and mint arrow paper, setting the perfect backdrop for her name in String Art. 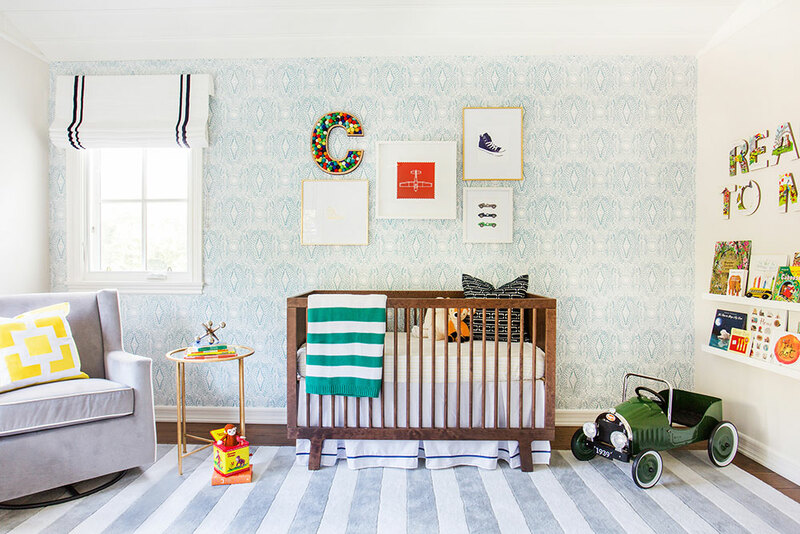 Check out this nursery! 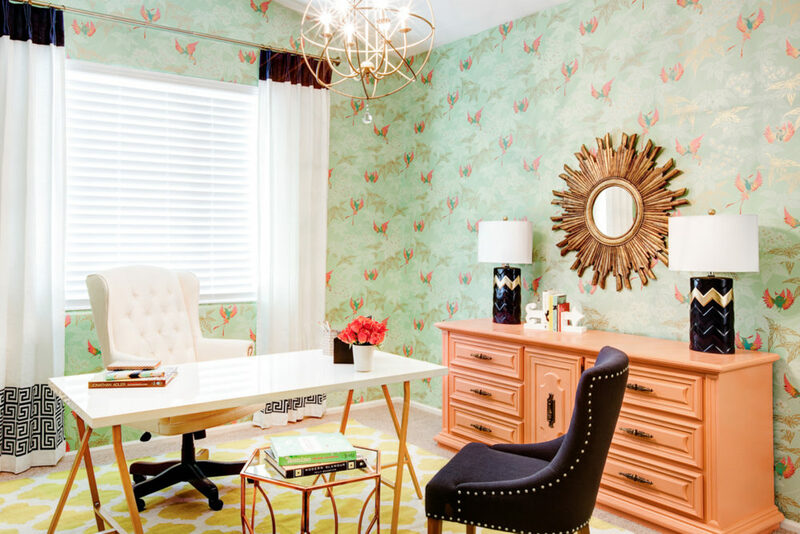 Maybe, you don’t want to wallpaper the entire room in a print…Next best look? Panels of wallpaper wrapped in Molding. The result is dramatic and can be budget friendly too! 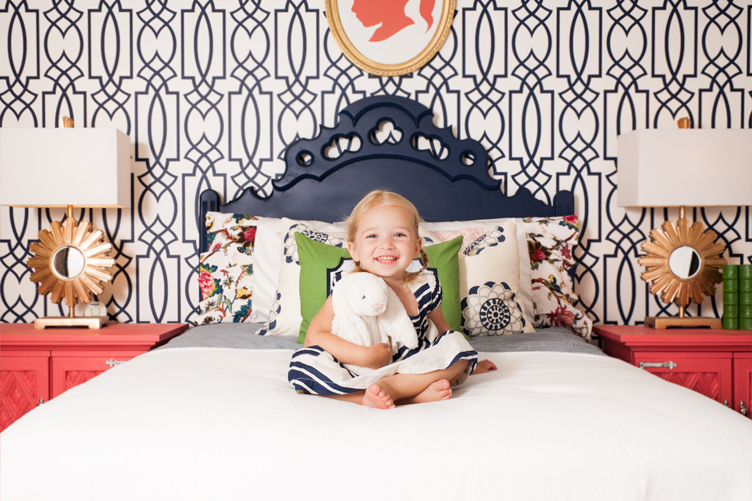 We adore this whimsical print for Emery’s room from Hygee and West. Who loves Butterflies!! We do!! 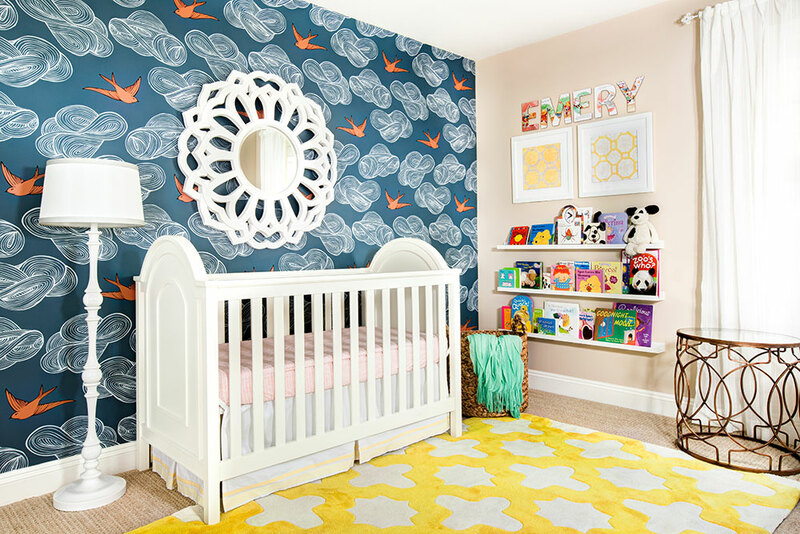 This custom created wallpaper was designed just for Kendyl and Remi’s room, and it is one of our top sellers. Find it here! Marin’s sweet Vintage/ Prep Room shows off another one of our best sellers. This navy garden trellis gives a beautiful architectural punch! Perhaps you have a little gentleman and are looking for something a bit more rustic? How about a wood wall, without the mess? Look no further! Have we inspired you to give wallpaper a try? It’s amazing how it can change a room, make it seem bigger even!